Turkey is a popular domesticated bird, most commonly associated with Thanksgiving dinner in the United States. When roasting, the temperature must reach 180 °F in the thigh of a whole turkey (center of the stuffing should reach 165 °F) before removing it from the oven. Cook a turkey breast to 170 °F. Alive the turkey is a partially flightless bird only capable of flying short distances, like chickens. They have dark brown feathers all over their body with black and white feathers on their wings. The males have a peacock like tail, but short that are black and white as well. Some females are even white. There are no feathers on their heads and they have a large red waddle. In the grocery stores they are found in most cases already frozen and bound, headless and plucked like most grocery store fowl. 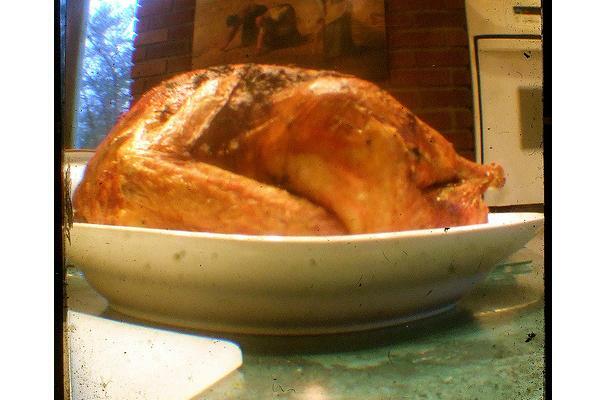 Choosing: Look for a round, plump turkey- turkeys with flat chests contain more bones than meat. If purchasing from a freezer section grocer, be careful for freezer burn and looked for package date. Make sure there are no holes in the packaging. Buying: In most grocery stores turkeys are available year round. In meat markets and butchers, they are usually available only in the month preceding and after thanksgiving and Christmas. Procuring: Turkeys are commonly found throughout the forests of the United States and even down in Northern Mexico. Turkey hunting season is usually in the later spring months, but most turkeys come to the grocer through turkey farms found all over the United States. Commercial breeds of turkeys are grown for their large breast and quick growing season. The Broad Breasted White turkey is the most commonly used breed in commercial turkey farms. Heritage breed turkeys are smaller, and take longer to grow to market size, and are raised organically or in organic-like conditions, often free ranging. Heritage breeds mature with hen turkeys in the 7 - 20 pound range, and tom turkeys in the 12 - 35 pound range. Most turkeys are roasted in an oven, fried in a frier, or cooked in a rotisserie. They are cleaned and trussed, and occasionally basted with various flavorings and seasonings. Popular uses for leftover turkey meat: sandwiches, salads, stews, and the broth kept for soups. History: Turkeys are native of Mexico, at the time of the aztecs; called "guajolote" in spanish. Benjamin Franklin used to compare the drawn bald eagle on the first US Seal to a turkey. The turkey is the most common main course for US and Canadian Thanksgivings and Christmases.